The carbon fiber body kit includes wider fenders that broaden the front by 1.18 inches and rear by 1.97 inches. Gemballa is a venerable name in Porsche tuning, and it's latest upgrade pack gives the 911 Turbo a major power upgrade. The Gemballa GTR 8XX Evo-R also gives the machine a meaner look to match the extra power. The package retains the 911 Turbo's 3.8-liter flat six but pushes the output to 807 horsepower (602 kilowatts) and 810 pound-feet (1,098 Newton-meters). This is quite an upgrade over the Turbo S' stock 572 hp (427 kW) and 516 lb-ft (700 Nm), and it even puts the GT2 RS' 690 hp (515 kW) and 553 lb-ft (750 Nm) to shame. 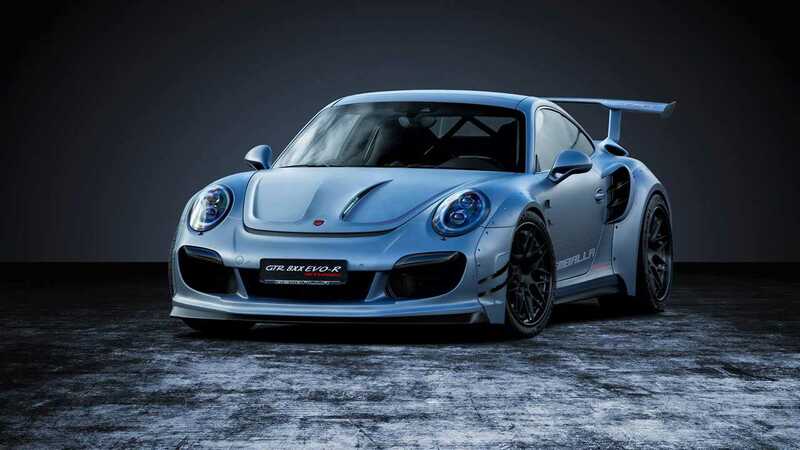 Gemballa claims that the package's upgrades let 911 Turbo accelerate to 62 miles per hour (100 kilometers per hour) in 2.38 seconds and hit 124 mph (200 kph in just 7.5 seconds. The coupe tops out at 230 mph (370 kph). For reference, the GT2 RS hits 62 mph in 2.8 seconds and a top speed of 211 mph (340 kph). A complete carbon fiber body kit complements the extra power. Looking at the front, there's a new, vented hood and a new bumper with three huge intakes. A large splitter sits below it. In profile, there are huge fender extensions that extend the front by 1.18 inches (30 millimeters) and rear by 1.97 inches (50 mm). Big canards direct the airflow. The back features a gargantuan wing that also includes inlets for the engine and a big diffuser. Buyers can choose whether the carbon pieces come with a matte or gloss finish. Porsche is currently updating the 911 lineup, and a new Turbo is on the way. Rumors suggest the output should top 600 hp (447 kW).